The church of All Saints in Houghton Conquest is to the west of the main village, to the north of the main east-west road through the village. Parking is available outside the church. 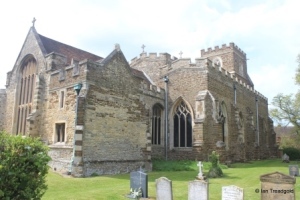 The church consists of a nave and chancel, two aisles, vestry to the north of the chancel, a south porch and a west tower. 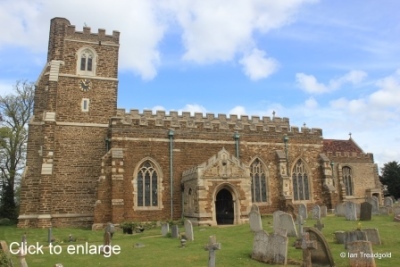 In size, the chancel is around 40 feet by 19 feet and the nave adds 64 feet by 16 with the aisles adding a further 12 feet in width. The tower is around 14 by 13 feet and about 40 feet in height. 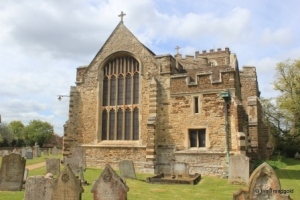 Much of the basic structure of All Saints dates from C14 with the porch and vestry being added in C15 with the nave clerestory and aisle walls being heightened around the same time. The tower is documented as being built in 1393. Much restoration was necessary in C19 as the building had become much neglected and in a poor condition. 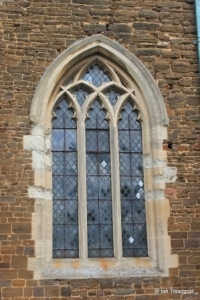 Many of these restorations related to the internal fabric although work was also done to the windows, roofs and tower. The south aisle has two window to the east of the porch and a third to the west. 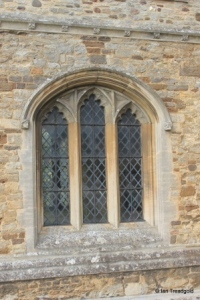 The two windows to the east of the porch are of three cinquefoiled lights with perpendicular tracery above with a quatrefoil design under a pointed arch. 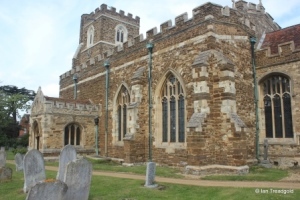 The church is embattled throughout and the rebuilt south porch has glazed windows to the east and west, each of three cinquefoiled lights under a flattened four centred arch. 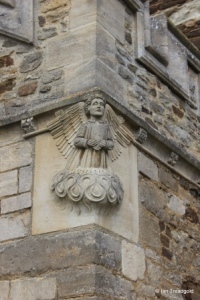 The porch entrance has a statue niche above and unusually two carvings of angels on the outer angles. The western window of the south aisle and the west window of the same aisle are the same being of three elongated cinquefoiled lights under a two-centred arch with intersecting tracery above. 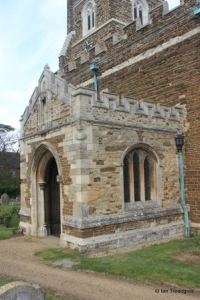 The tower is of three stages with angled buttresses and a protruding octagonal stair turret in the south-west corner. 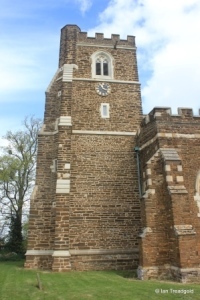 There is a clock face to the south and two-light belfry openings on each side. 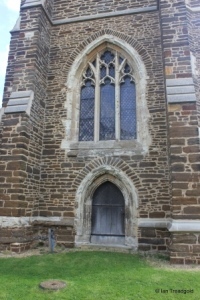 The west window is of three trefoiled lights under a two-centred arch with perpendicular tracery above. 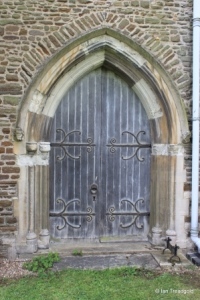 The west door is quite low and under a pointed arch. 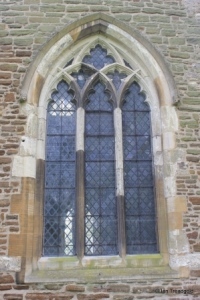 The north aisle has three windows to the north to match the south aisle. It also has west and east windows whereas the south aisle has just a west window. The west window, western and central window are all of three elongated cinquefoiled lights to match the west window of the south aisle. 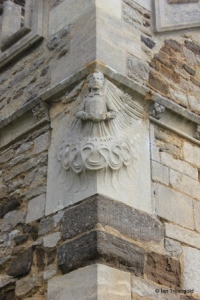 The north doorway has shafts although the capitals of those to the west are much eroded. 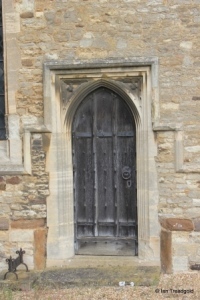 The doorway is under a two-centred arch. 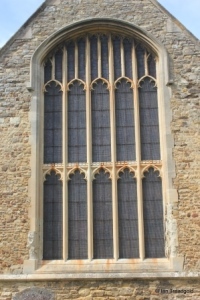 The eastern and east windows of the north aisle are the same and are of three light cinquefoiled windows with geometric tracery above under a two-centred arch. 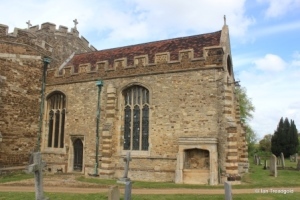 The chancel has two windows to the north with the vestry to the east of them. 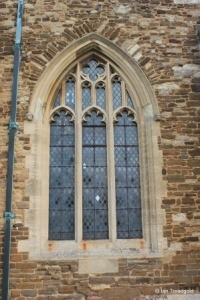 The two windows are both of three cinquefoiled lights with perpendicular tracery above under four-centred arches. The vestry has modern square headed windows with a gabled and embattled roof above and was once of two storeys. 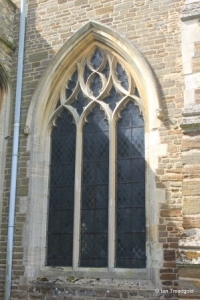 The tall east window was restored in the latter part of C19 and is of five lights divided by supertransoms to form gridiron tracery all being cinquefoiled in design with perpendicular tracery above under a four-centred arch. 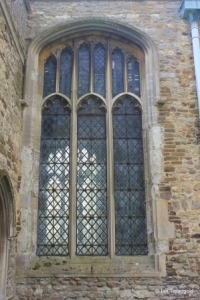 The south side of the chancel has two windows matching those on the north side, being of three cinquefoiled lights under four-centred arches with perpendicular tracery above. 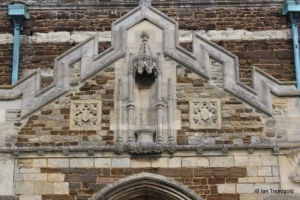 The priest’s door has a square head over the pointed arch with floral motifs in the spandrels. 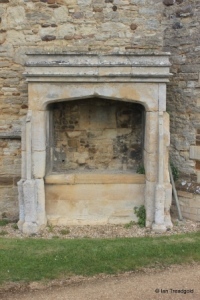 Towards the east of the chancel is a canopied tomb, believed to belong to Thomas Awdley who died in 1531. Page last changed 03/05/2015. Reformatted 26/02/2016.